Make no mistake about it, the Big Law firms that played a major role in the Wall Street corruption that led to the financial crash of 2008 and have been burying corporate crimes through their crony ties to Washington for decades, are desperate to put their own man in the White House in 2020. On Tuesday, former Attorney General, Eric Holder, who headed the U.S. Department of Justice in the Obama administration, appeared on the MSNBC program, “All In with Chris Hayes.” Holder told Hayes that he was considering a run for the President of the United States in 2020 but had not made a final decision. (See video below.) Obviously, if Holder ran, it would be as a Democrat, something that is certain to enrage the progressive wing of the party. Holder effectively transplanted his pals from his law firm, Covington & Burling, into pivotal spots at the Justice Department during his reign there from 2009 to 2015. And exactly who is Covington & Burling? As we reported in 2012, this is the very law firm that was called out in the a Federal court decision for actively conspiring with Big Tobacco to hide the dangerous health effects of second hand smoke from the public for decades. So how did a law partner from a law firm with a history like that get picked by Obama to head the highest law enforcement agency in the land? In October and November of 2016 WikiLeaks released emails that had been provided to it by an unnamed source who had hacked into the email account of John Podesta. The emails pertained to Podesta’s work as Campaign Chairman for Hillary Clinton in 2016 as well as in 2008 when Podesta was Co-Chairman of President Obama’s Transition Team. Wall Street On Parade was one of the few news outlets that wrote about the bombshell emails that came from Michael Froman, an executive of the serially charged Wall Street bank, Citigroup. The emails showed that President Obama, using the email address of bobama@ameritech.net, was communicating directly with Froman at Citigroup as the bank was collapsing and receiving unprecedented amounts of secret money from the Federal Reserve as well as publicly disclosed vast sums of bailout money from the government. As the discredited bank was collapsing, Froman was feeding Obama lists of recommended appointments to his cabinet as well as recommendations for employees on lower rungs of the ladder. In less than a month after Obama’s election as President on November 4, 2008, Obama had nominated Clinton to be his Secretary of State and Holder as his Attorney General. Citigroup’s taxpayer bailout was the largest in not just U.S. history – but the largest in global banking history. Citigroup received $45 billion in equity from the U.S. Treasury; a government guarantee on $300 billion of Citigroup’s dubious assets; the Federal Deposit Insurance Corporation (FDIC) guaranteed $5.75 billion of its senior unsecured debt and $26 billion of its commercial paper and interbank deposits; and the Federal Reserve secretly funneled $2.5 trillion in almost zero-interest rate loans to units of Citigroup between 2007 and 2010. This bailout was done despite Citigroup’s long history of being a recidivist lawbreaker. On January 22, 2013 the PBS program, Frontline, dropped a bombshell on the behind the scenes workings at the Justice Department, which had failed to prosecute any top executive at a Wall Street bank for the crimes that led to the 2008 financial collapse. NARRATOR: Frontline spoke to two former high-level Justice Department prosecutors who served in the Criminal Division under Lanny Breuer. In their opinion, Breuer was overly fearful of losing. MARTIN SMITH (Frontline Interviewer and Producer): We spoke to a couple of sources from within the Criminal Division, and they reported that when it came to Wall Street, there were no investigations going on. There were no subpoenas, no document reviews, no wiretaps. 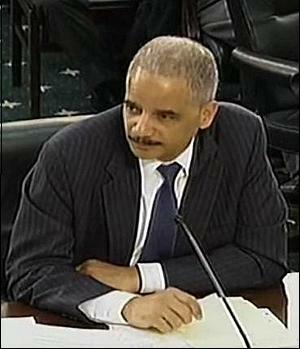 “Last year, Holder bought a condo 300 feet from the firm’s headquarters. The National Law Journal headlined the news, ‘Holder’s Return to Covington Was Six Years in the Making,’ as if acting as the nation’s top law enforcement officer was a temp gig. They even kept an 11th-floor corner office empty for his return. Breuer has gotten a nice promotion, now serving as Vice Chair of the law firm. Among his specialties, notes Covington, is “helping clients navigate financial fraud investigations.” Navigating financial fraud investigations is always so much easier for Wall Street banks if there are “no subpoenas, no document reviews, no wiretaps” as Frontline reported was how Breuer ran the criminal division’s oversight of Wall Street during his tenure there.